Former LRA commander Dominic Ogwen. File photo. GULU–Seven former wives of Lord’s Resistance Army (LRA) former commander Dominic Ongwen will testify as witnesses on Sexual Gender Based violence crimes, says a report from the office of the prosecutor of Internantional Criminal Court (ICC). Ongwen is a former LRA commander who was leading Sinia bridgade and is currently facing 70 counts of war crime and crime against humanity in The Hague, Netherland. 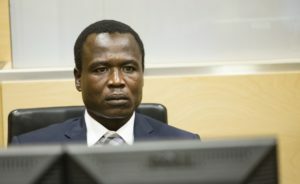 While addressing journalists on Monday in Gulu town, Dahirou Sant-Anna, an Internantional adviser to the ICC prosecutor, said six out of the seven women, majority being Ongwen’s former wives during his time in the LRA activity, have already testified and the remaining former wife to the rebel commander will testify by January 2018. The report also shows that 60 live witnesses, including the six former wives, have so far testified against Ongwen since the trial began and 16 more live witnesses are expected to testify by the start of next year. Dahirou noted that a total of 116 witnesses will be used against Ongwen; 76 witnesses will be presented before the judges in the court chamber and 40 will have their statements used in court. Three mental health expert witnesses are also lined up to testify against Ongwen after he told judges that he was not mentally sound during the insurgency. “Three of the witnesses are mental health experts who will provide forensic assessment of Dominic Ongwen’s mental health in particular regarding the period he is being charged,” Dahirou says. Dahirou said Ongwen’s claims of mental problem are aimed at eluding criminal responsibility in accordance with the Rome statute, adding that court cannot pronounce itself on the matter until the due process is concluded. He said the court session will resume on January 15, 2018 and is expected to be completed in March next year, adding that it will be the first case heard for a short duration.